Nuts on their own are a delicious and satisfying snack. But when it comes to baked goods and recipes, toasting the nuts will add depth to both the texture and the flavor, and allow the nuts to compete with stronger flavors instead of fading into the background. Think toasted walnuts and bananas – without toasting the walnuts, the banana overtakes the baked good, and all you get is the “crunch” when you find nuts. If you’ve never toasted nuts before, you might be feeling a little intimated. But there really is no need! You can toast nuts in a myriad of ways – in the oven, on the stovetop, or even in the microwave – yes really, the microwave! Toasting nuts releases their essential oils. This causes the nuts to become more fragrant and flavorful than in their raw state. As a topping for oatmeal, yogurt, salads, or sundaes! Spread a single layer of nuts on a microwave safe plate. Cook them in 1 minute intervals on full power, until the nuts have a crisp crunch, toasted flavor, and have become fragrant. The amount of time it takes varies per nut. You will not get the same dark color you get from oven or pan toasting, but this will do in a hurry when you don’t want to dirty a pan or heat up the oven for such a simple task. Stir frequently with a spatula until the nuts turn golden brown and smell mouth-watering. Remove from heat, and if necessary, from pan, as they will continue to cook after being removed from the heat. The oven method is the most often used when toasting a large volume of nuts. Preheat the oven to 350°F. When the oven is ready, use the table below to cook to your specified nut. Spread the nuts in a single layer on a baking sheet. If using mixed nuts, 15-20 minutes will probably suffice to make sure all the nuts are done, but check them often. You may also want to stir and flip the nuts at the half way mark on time, to make sure that all nuts are heating evenly, but it is not necessary. If you have toasted any nuts that have skins on them, like peanuts or hazelnuts, simply allow them to cool for a few minutes, and then place the nuts in a clean and dry kitchen towel. Rub them vigorously with the towel, and the skins will slip right off. Don’t worry about any skins that do remain, however. They will not affect any food you add them to, and the skins are safe to eat. The table above is a simple time guide. Ovens heat differently, so your timing may vary. Please check the nuts often, and make sure to stir them if it appears the nuts are getting more done on one side of the oven. You can also rotate the baking sheet in the oven. I absolutely adore your blog! What a nice way to get more flavor out of nuts! Very nice, crips tutorial. I like the time guidance for the different types of nuts, I’m always struggling to not burn mine. A great guide! Thank you!!!! Toasting the nuts gives what you bake a whole nother level of aroma as well – really takes a dessert from ho hum to something special. It is very thoughtful of you to put the instructions together in that little grey card. I am printing this and sticking on my fridge! Thanks. Thanks for this post! The chart will come in very handy! This is useful for my mom, my mom is fighting thyroid cance and she eats a lot fo nuts. The table is great, thanks. I have a technical question. I wonder if one could toast dehydrated nuts. I thought toasting nuts would be much more difficult than this. Thank you for sharing! I’m sure my dad will love to try this out. Really nice post, and thanks for the timing charts on the different nuts. 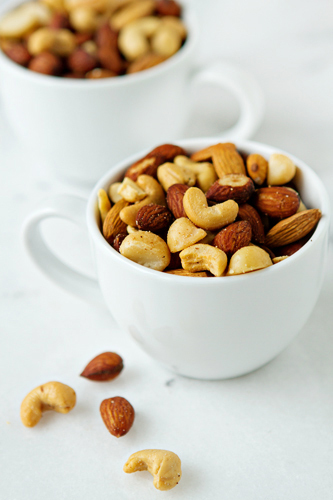 You’ve got to be REALLY careful with mixed nuts, because some of the nuts are high oil and tiny (like cashews) and some will be huge like filberts, so you’ll be checking the nuts often to make sure the smaller ones don’t burn. I love toasted nuts in everything from eating them individually to mixing them in cookies & confections and also grinding them up into nut butter. Once you’ve tasted a raw nut compared to a toasted nut, you’ll never go back to un-toasted. Ooh, thank you! This post just reminded me I have trail mix in my drawer. Was looking for something to snack on! I had no idea that you could toast nuts in the microwave! That is great to know! thank you for this posting of toasting nuts and the time lines….in helps because i’m always afraid that i may burn them or that i’ll somehow screw it all up so i’ve never tried to toast any nuts….i didn’t notice pistachio’s. are they normally already toasted if you buy them already shelled?? Does it matter whether you chop pecans before or after toasting them? Thanks. It doesn’t matter in terms of the toasting process, but you might need to adjust the cooking time. They’ll cook faster the smaller they are. Cashews run the same as hazelnuts or macadamias because they’re larger and have higher fat content than other nuts. Very well explained Jeanie. I ve bookmarked your page right away. Hi. I soaked my almonds. Should I dry them first and then roast or can I just immediately roast them after I am done with soaking and rinsing. ? And I only have a microwave convection oven. So, how long do you think I need to roast the soaked almonds ? Hi, Tracey! I’ve heard of putting honey, maple syrup, and brown sugar on nuts for a sweet taste. You could also create a spice mixture of maybe cumin, cinnamon, and cayenne pepper for them as well. I hope you enjoy them!